Vaneometers are portable test equipment that indicate air velocity. This model includes a swing vane that is low cost and is designed to simplify the measurement of low air velocities. 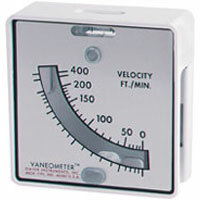 Vaneometer™ Swing Vane Anemometer. Economical and has a spirit level for accurate readings and large scales. Can the Vaneometer model 480 be equipped with a scale to read in inches of water? We want to use the vaneometer to assure we have a pressure differential of -0.01 wc when measured at the door gap to a patient isolation room. The series 480 does not come with a scale reading in inches w.c., the scales would be in velocity units to read air velocity. However, we do have differential pressure gages or manometers than can be used to measure the differential pressure in an inches w.c. scale. I would recommend taking a look at our Series 2000 Magnehelic® Differential Pressure Gage, as we do have many customers use these for clean room applications. We have the model number 2000-00N which has a range of 0-0.2. and the major grads will be 0.01” w.c.